Calling all Christian disc golfers world wide! We need to unite and show the world who we are. Disc Golf is a wonderful and very natural Sport that God has provided us to enjoy everything he has created in nature. It involves excellent physical activity and the same power and accuracy as ball golf. However, disc golf in most cases is FREE to play once you have a disc (frisbee) and it offers an excellent chance to reflect on all that God has done for you in your life. Bring friends, Family, Church Family and ask the Lord to join you for a round. Although God is there with us at all times when we play a round with the Lord you would be amazed at what lessons in life and in Disc Golf He can teach us. 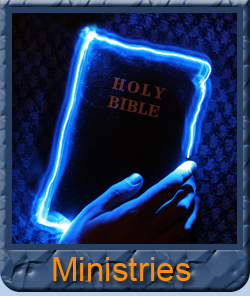 Ask for Him to forgive your sins and open your heart and mind to Him before you start each round and play in His name. Spring Promo JOIN NOW For FREE! Put God first in everything you do. Introduce Christians to disc golf and introduce non-Christian disc golfers to Jesus Christ. Unite Christian Disc Golfers from all corners of god's Green earth. Support the growth of disc golf as a sport. 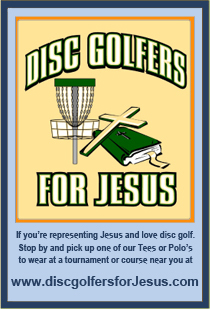 Support events to introduce new players to Jesus Christ and the sport of disc golf.